Batteries — When your renewable energy system is not producing energy (or is producing at low levels), you will need to rely upon stored energy for your needs. 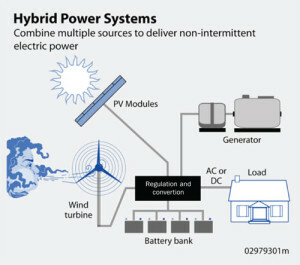 Batteries store the energy produced by renewable energy sources and the back-up generator. In off-grid applications, “deep cycle” batteries (generally lead-acid) are typically preferred. Deep cycle batteries can repeatedly charge and discharge up to 80 percent of their capacity without significant wear on the battery. Shallow charge batteries (like automotive) can only be drawn down by about 20 percent, and are not recommended. Deep-charge batteries can be expensive, but the amount of expense depends both on the amount of load (demand) the system will place on the battery and the amount of storage required. For example, some homeowners are comfortable with storing one to three days of electricity demand. Others may feel that they need to store more energy. 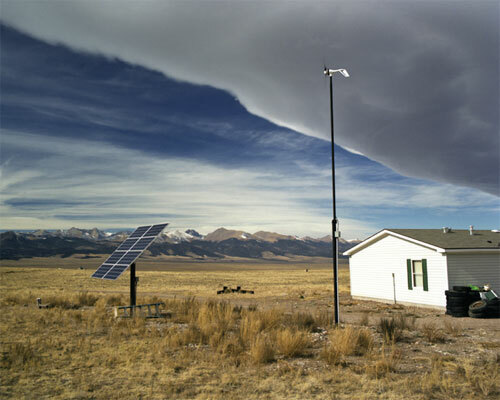 For example, a homeowner with a wind and solar-based system in Montana or Wyoming may consider weather patterns – are there multiple days in the winter when temperatures are well below zero, the wind is not blowing and it is cloudy? Homeowners also need to consider battery space and location. For health and safety reasons, batteries need to be stored in an area that accessible and well ventilated but isolated from living areas. New home construction can plan for a battery storage area. Existing structures may require retrofitting to accommodate batteries. • Power quality is especially important if you intend to operate sensitive electronic equipment such as computers and high-definition televisions, which cannot withstand much power distortion. Inverters range in cost based on the quality of the power you intend to use, as well as the features that you include in your power-conditioning package. The conditioning equipment you require is dependent on many factors and needs to match the voltage, phase, frequency and sine wave profiles of your generation source. A qualified off-grid system designer can help you to determine your needs. Safety Equipment — You will need to ensure that your system has safety features installed. Three common safety elements are safety disconnects (which either disconnect the system in a generation malfunction, or can be disconnected when you are performing system maintenance), grounding equipment, and surge protectors. Meters and Instrumentation — Meters and monitoring equipment enable you to track your generation system output, as well as battery charge and your consumption. Costs will vary based on the level of monitoring you desire.